Cornbread is a must have in my house. The kids and my dad are constantly asking for it. After many attempts, I have finally come up with a recipe that is moist and not too crumbly. 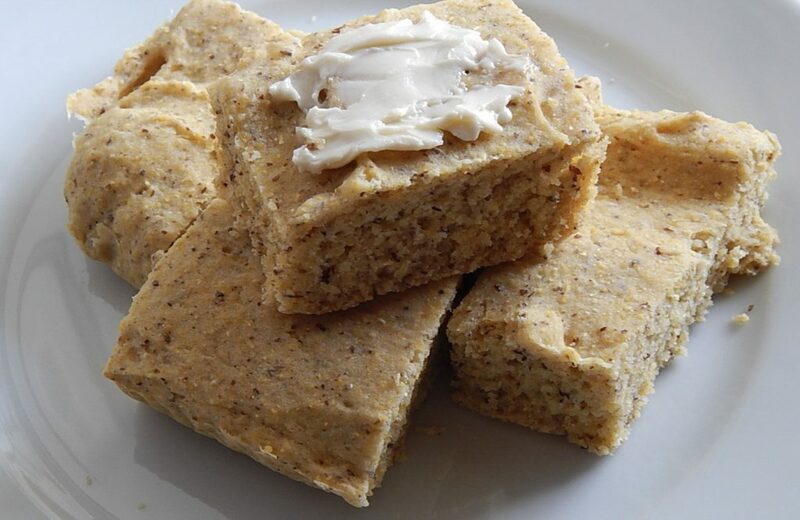 This cornbread is so good when it is still warm from the oven and has butter melting on it. The only bad part is that I always eat too much of it. Tonight was another night when I needed a quick dinner. We got home really late last night from our trip and were busy at church today, so I didn’t want to spend a lot of time in the kitchen. This pasta was finished in about 15 minutes. The longest part of cooking this meal is waiting for the water to boil. Even though it is quick it has tons of flavor. Bring a large pot of water to a boil and cook the pasta according to package directions. While the pasta is cooking bring 1/2 cup of water to a boil in a pan. Add in the onions and cook for 5 minutes. Add more water if needed to keep the onions from sticking. Add in the garlic, sun dried tomatoes, balsamic vinegar and beans. Cook it for a couple more minutes. 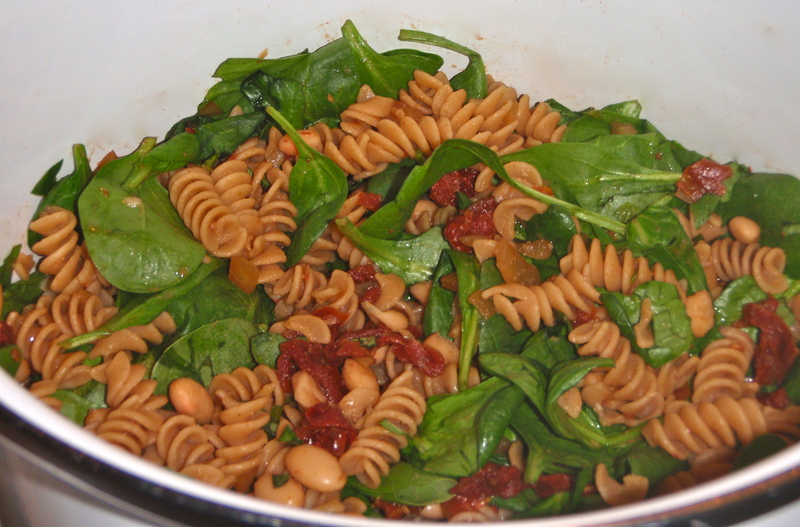 When the pasta is finished cooking drain it and return it to the pot. Add in the onion mixture, the spinach, the basil, olive oil and salt and pepper. I was getting ready to go out of town for a few days, so I needed to make a quick dinner in the midst of packing. 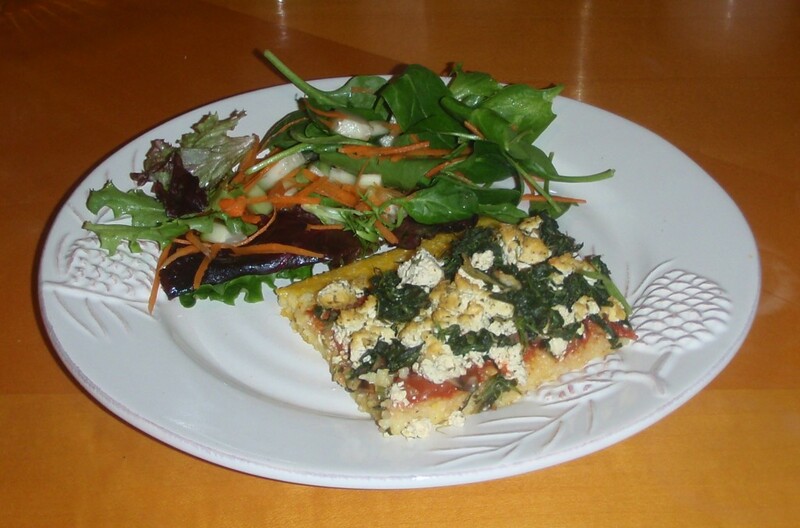 This meal is super easy to make, but is so good and nutritious. The quinoa is packed with protein. I served the quinoa with a collard green salad tonight, but I usually just put it over some mixed greens. You may want to double the recipe because it makes a great lunch the next day. Bring the water to a boil in a medium sized pot. Add the quinoa and the curry powder. Turn down the heat to medium low and cover. Cook the quinoa for 15 minutes. Once all the water has been absorbed stir in the frozen peas and let the quinoa cool to room temperature. 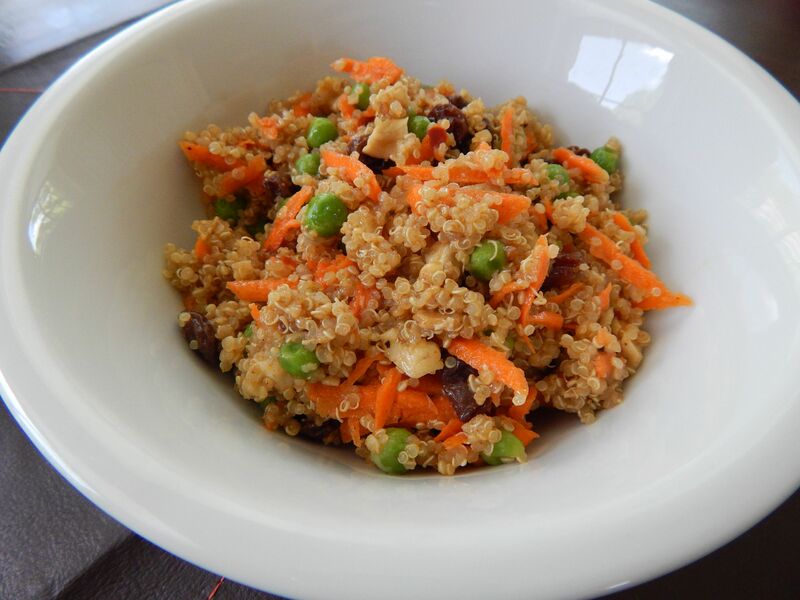 In a large bowl combine the quinoa carrots, chick peas, cashews and raisins. In a small bowl whisk together the oil, vinegar, salt and pepper. Pour it over the quinoa and mix it well. Can you serve it chilled or at room temperature. Since my daughter had her surgery she can’t eat really crunchy or hard food, but she wanted to have some veggie pizza. I made this pizza for her with a polenta crust. The polenta holds all the toppings really well, but it softer than a regular crust. 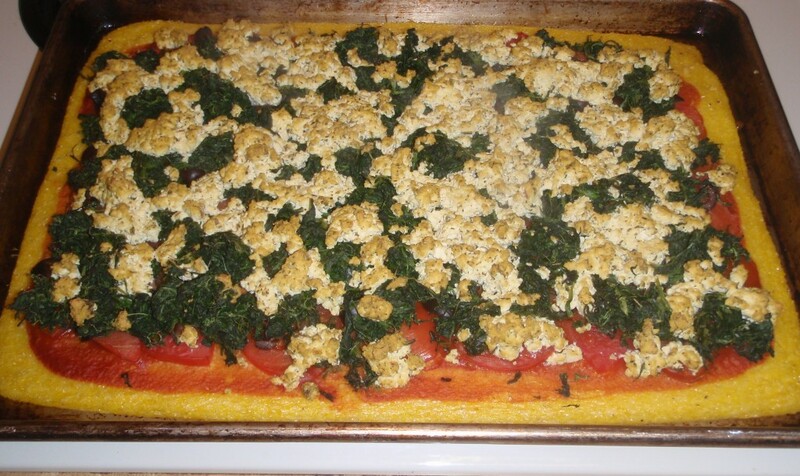 This is not a pizza that you can pick up to eat, but the polenta is so good with all the veggies. I topped this pizza with tofu ricotta and lots of veggies. The polenta crust is great with any pizza toppings that you like though. Cook the polenta according to the package directions until it is very thick. I do not use the instant, so I boil the polenta in 6 cups of water for about 20 minutes. Stir it frequently. Stir in the salt and pepper. Pour the polenta onto a large lightly oiled sheet pan and smooth it out. Let it sit at room temperature for at least an hour so it can firm up. Preheat the oven to 400. Once the polenta is firm bake it for 20 minutes. Take it out of the oven and add you toppings. Bake it again for another 15-20 minutes until the polenta begins to brown around the edges and on the bottom. This is great as a pizza topping, for lasagna or stuffed shells. 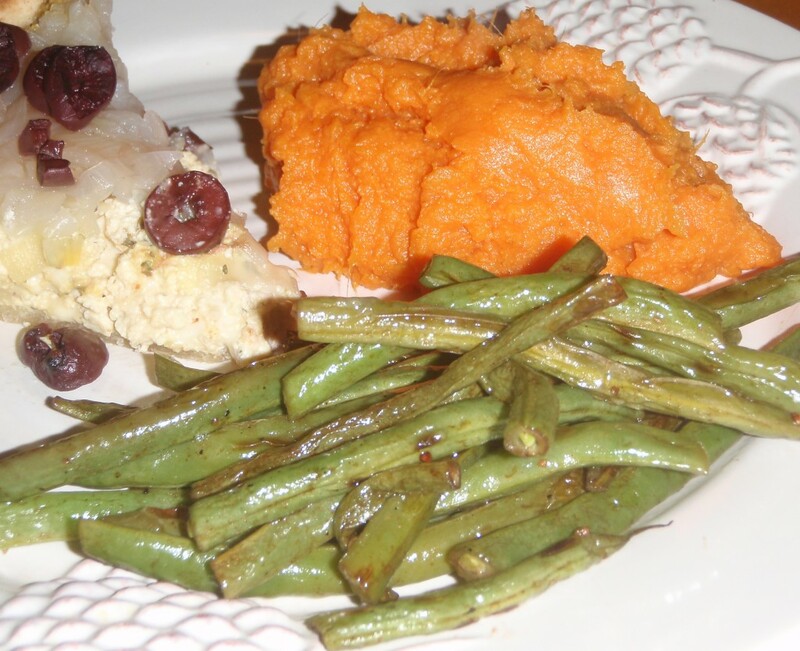 The mashed sweet potatoes and roasted green beans are great side dishes for any meal. They are super easy, so they are great to do during the week and they are fancy enough for a special dinner. We eat sweet potatoes all the time, so I try to make them in different ways and this is definitely a favorite of the kids. Mashing them is als really great for kids who may not like to try new foods. Roasting the green beans brings out the sweetness in them that you don’t get when the beans are boiled. This is my favorite way to have green beans now. Bring a large pot of water to a boil. Peel the potatoes and cut them into 1 inch cubes. Add them to the pot and cook for about 15 minutes until the sweet potatoes are fork tender. Drain the potatoes and return them to the pot. Add in the remaining ingredients and mashed the sweet potatoes until you reach the consistency that you like. If they are little dry just add more liquid a little at a time. Preheat the oven to 425. Toss the green beans, oil, vinegar, salt and pepper on a large baking sheet. Try not over crowd the pan, you may have to use 2 pans if your pans are smaller. Roast the green beans for about 10 minutes. 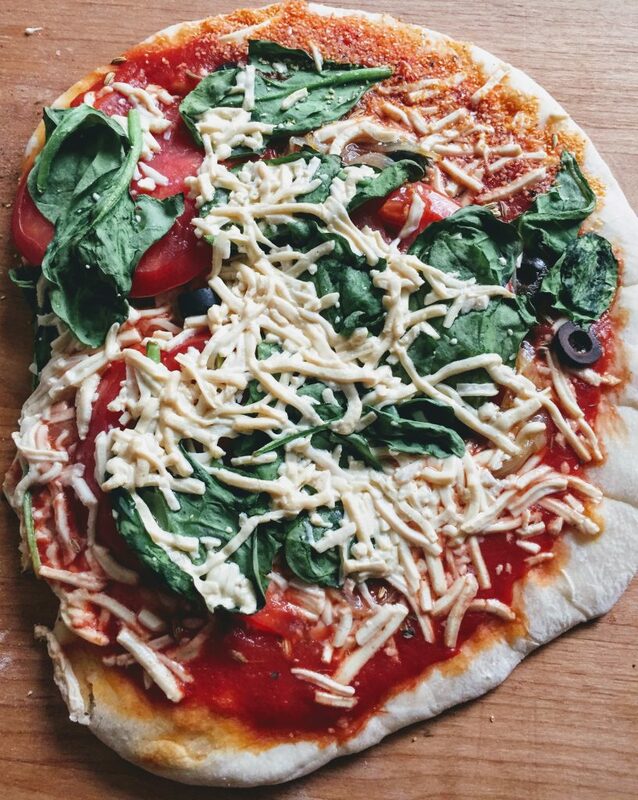 Homemade pizza dough topped with tons of veggies and vegan cheese. 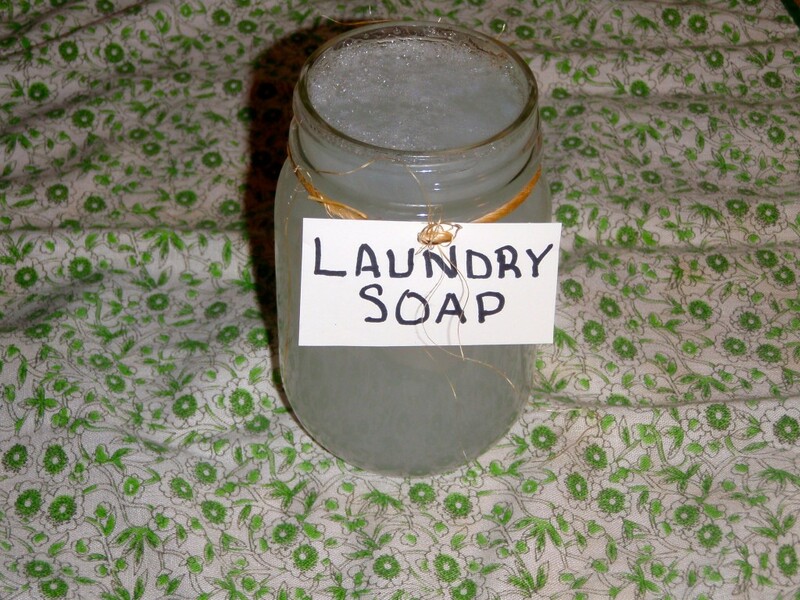 Making your own laundry detergent only takes a few ingredients and is super easy. It also is free from all of the added chemicals and artificial fragrances that are found in commercial detergents. This weekend my kids asked for strawberry pancakes, which I have never had before. They were actually really good, so will be making them again. I always use the same basic pancake recipe and then just add in whatever fruit I feel like that day. My family’s favorite are apple cinnamon. Of course the kids love chocolate chip pancakes, but those are only for special days like birthdays. This pancake recipe makes enough for 4, but I usually double it so we have some leftover for a quick breakfast during the week. Combine the soy milk and the vinegar and set aside. In a large mixing bowl combine the flour, baking powder, baking soda and salt. Add the agave, vanilla and oil to the soy milk. Mix the wet ingredients into the dry until it is just combined. Don’t over mix it. Add in the fruit if you are using it. 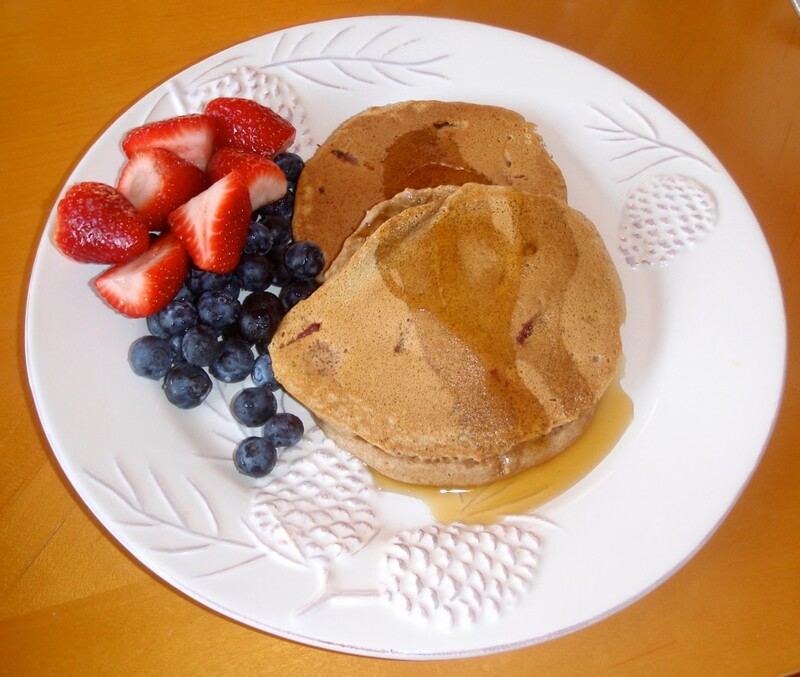 Cook the pancakes over medium high heat on a griddle or non stick pan lightly oiled of sprayed. Cook until bubbles appear all over the top and then flip them and cook for a few more minutes until they are nicely browned. You can keep them in a warm oven until you are ready to serve. Hope everyone enjoys the Vegan Pancake Recipe!!! When I lived in Colorado, I became addicted to green chili sauce. They put it on everything out there. It usually has pork in it, so I had to come up with my own version when I became vegan. It is a little spicy for my kids, so I usually bake the enchiladas ( or whatever I am putting it on) without the sauce and then add it to mine. Heat the oven to 375. Heat the tortillas in a skillet or on a griddle sprayed with cooking spray until they begin to brown to each side. Put the garlic in the food processor and blend until it is finely chopped. Add in the cooked beans and blend until most of the beans are pureed. You want it to have a little texture. Lightly oil or spray and large casserole dish. Fill each tortilla with 2 TBSp of the bean mixture and a little bit of spinach. Roll them up tightly and place the enchiladas in the dish. When all of the enchiladas are filled, cover them with the green chili sauce and top with the cheese. 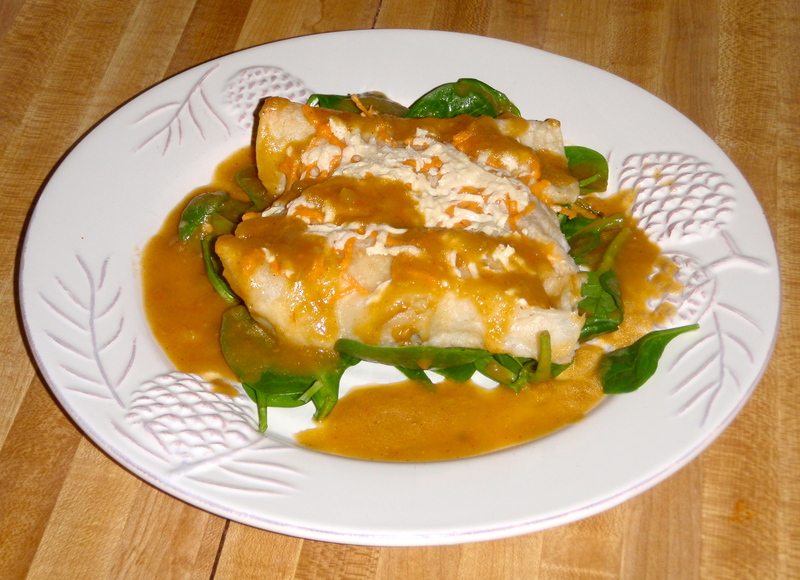 (You can also bake the enchiladas without the sauce and add it later if not everyone likes spice.) Bake the enchiladas for about 25 minutes until the cheese is all melted and the sauce is bubbly. Heat the oil in a large sauce pan. Add in the onion and cook for 5 minutes. Add in the rest of the ingredients and bring to a simmer. Let the sauce simmer for at least 1 hour. You can also let it cook in the crock pot on low all day. Use a standing blender or immersion blender to blend the sauce until it is smooth. Any leftover sauce can be frozen or refrigerated for a few days. Happy New Year! 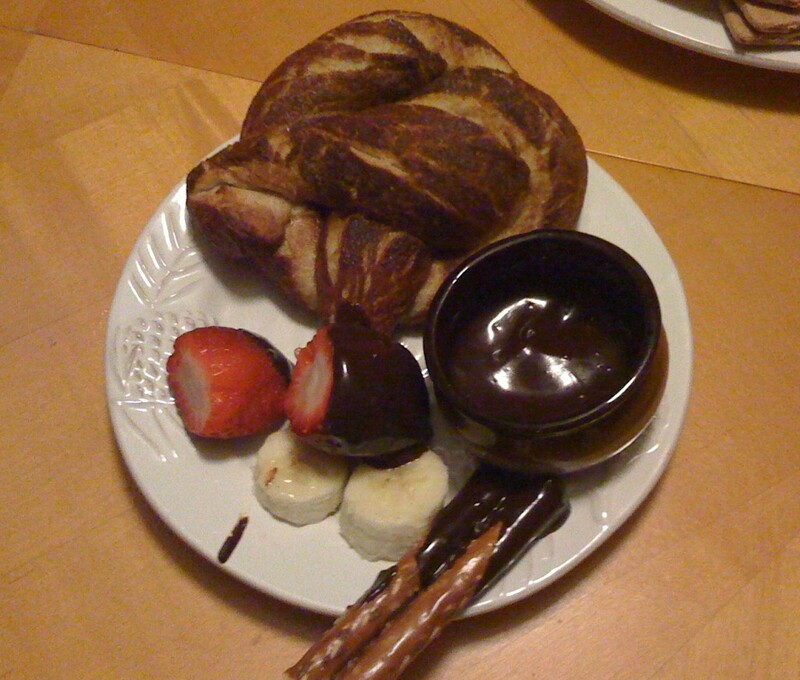 Last night I made vegan cheese fondue for dinner and vegan chocolate fondue for dessert. I haven’t had cheese fondue since becoming vegan and I really wanted it, so I gave it a try. It was delicious. The chocolate was unbelievably good and of course I ate way too much of it. It was a great way to start a new year. Combine all the ingredients except the beer in a sauce pan over medium heat. Stir until the cheese starts melt. Slowly add in the beer a little at a time until the cheese reaches the consistency that you want for dipping. I used about 1/2 the bottle. Serve warm. Combine the soy milk and the butter in a sauce pan over low heat. Once the butter is melted add in the chocolate chips and the vanilla. Stir constantly until the chocolate is melted and smooth. Serve warm. 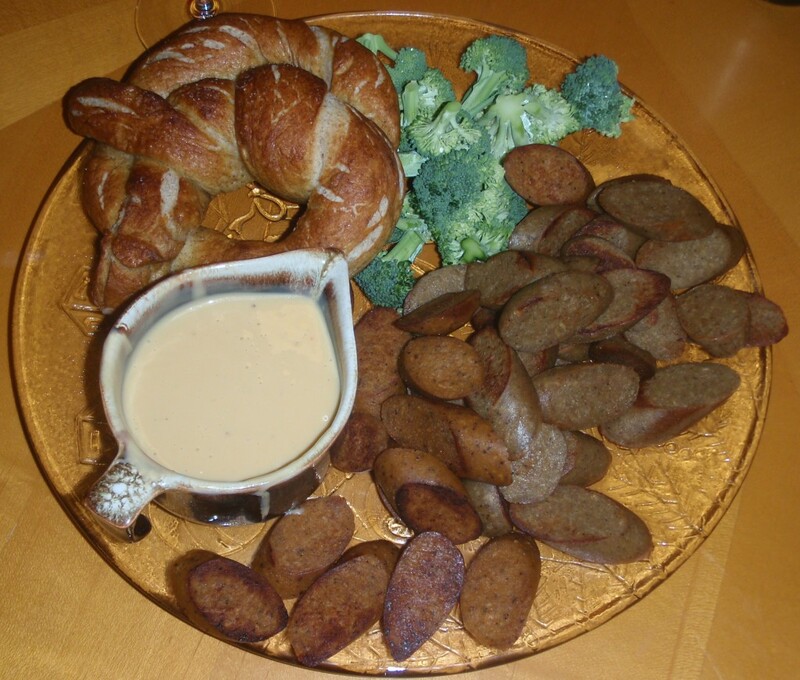 Hope you enjoy the vegan fondue! !